This listing is for a SET OF 2 RINGS! For an engagement ring and a matching fitted band, both will be the same size and are intended to be worn on the same finger together. 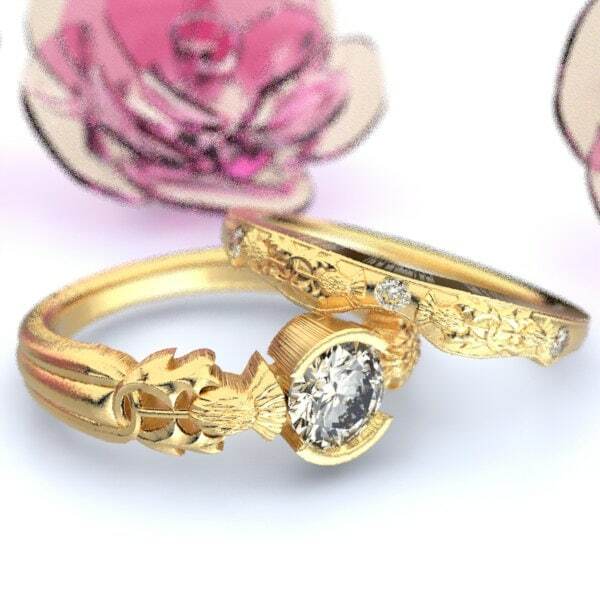 Featuring a 5mm (1/2 carat) moissante center stone held delicately in place by two adjoining thistles, with the matching band holding 3 small (1.6mm) moissanites in it, this ring set represents the fusion of Scottish heritage and modern engagement rings. 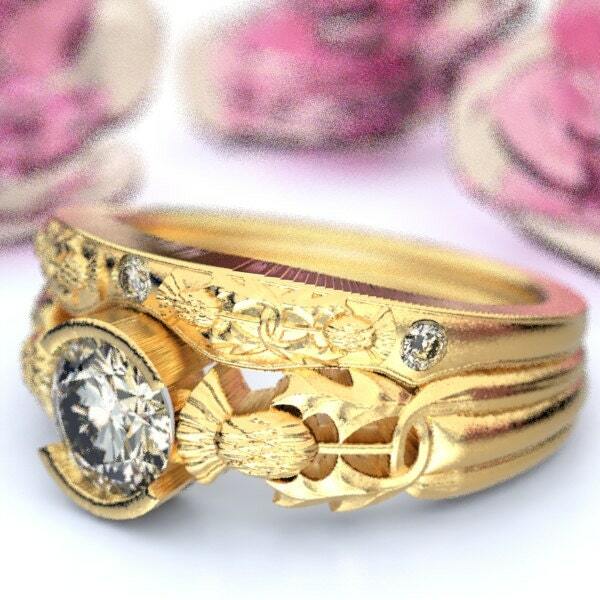 With the stems of each thistle woven together, the ring is emblematic of the union of eternal love and the interweaving of marriage. 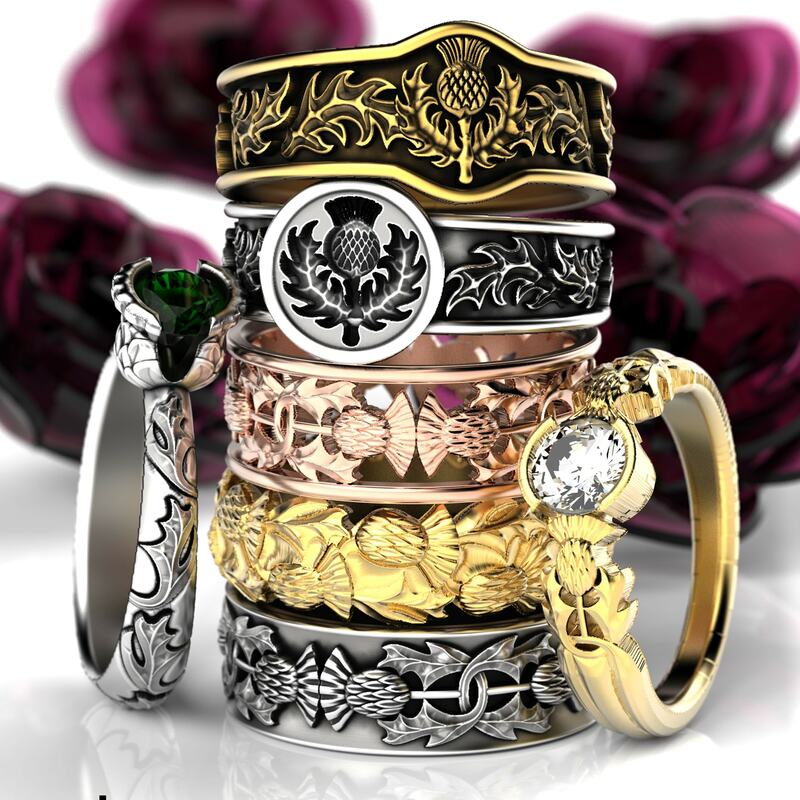 These rings are made to last a lifetime, and created in the tradition of rings meant to represent great devotion and bliss. 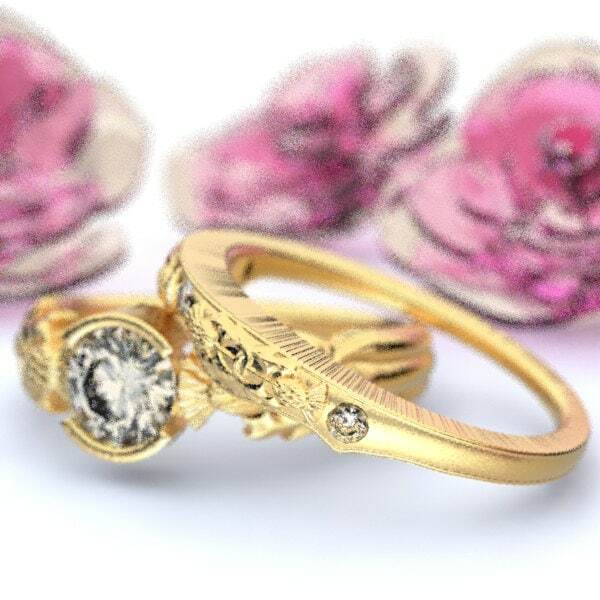 We can make this set with different sized stones, or different types of stones upon request. We have or can obtain any size and shape stone you wish, all of our stones are obtained through conflict free sources. 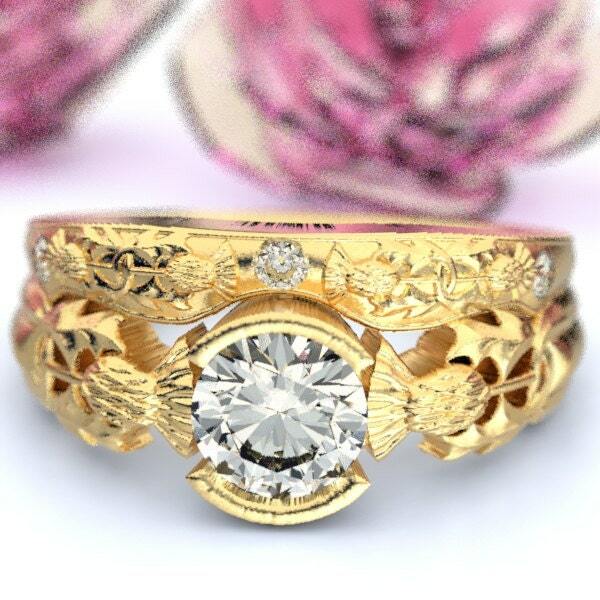 The thistle has been an enduring symbol of Scotland and Scottish heritage for hundreds of years. According to a legend, an invading Norse army was attempting to sneak up at night upon a Scottish army's encampment. During this operation one barefoot Norseman had the misfortune to step upon a thistle, causing him to cry out in pain, thus alerting Scots to the presence of the Norse invaders. The thistle has been the national emblem of Scotland since the reign of Alexander III and was used on silver coins. It is also used to symbolize connection with Scotland overseas. For example, in Canada, it is one of the four floral emblems on the flag of Montreal; in the US, Carnegie Mellon University features the thistle in its crest in honor of the Scottish heritage of its founder, Andrew Carnegie. 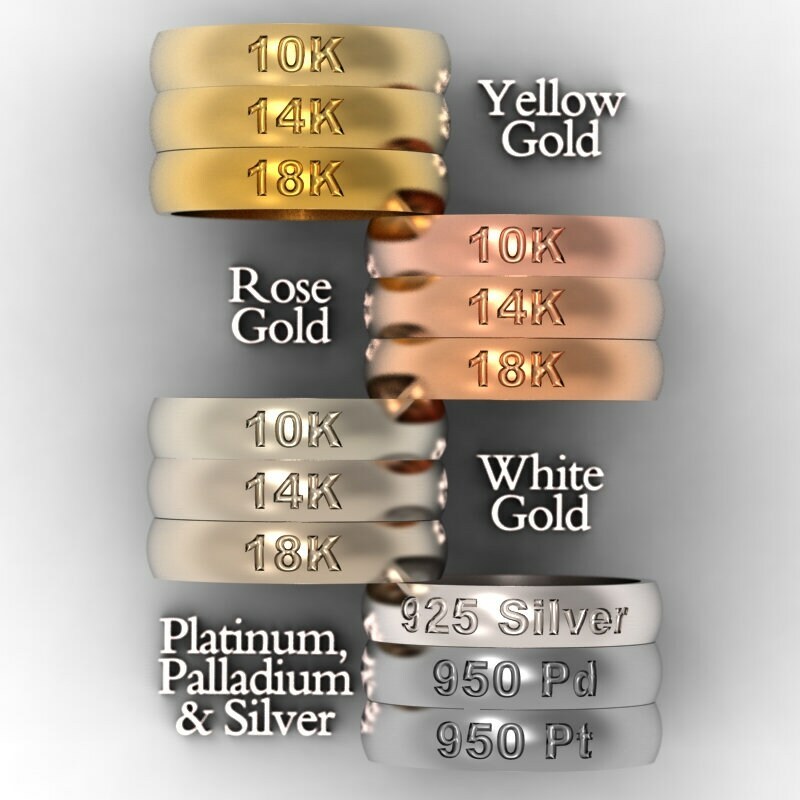 Cast in solid gold or .950 palladium or platinum, these rings are made of 100% recycled metal and your choice of gold color (either white, yellow or rose, see our color comparison photo). We can make these in either a polished or brushed finish, please let us know which you prefer when ordering.